Mmmm... maple! Maple is just one of those flavors that captures the sweetness of fall. Every time I pick up a bottle of pure maple syrup, I can't help but think of those big Vermont sugar maple trees with buckets attached to their trucks, capturing every bit of sap sweetness! However, the real stuff can be pricey. But suppose there was a gourmet specialty seasoning mix that still captures that maple flavor and perhaps adds a bit of spice? When I visited Urban Accents last weekend, they gave us these generoud goodie bags where I received their packet of Vermont Maple & Spicy Dry Glaze. Infusing meats with some serious flavor couldn't have been any easier. What's nice is that this combination of maple sugar, ginger, thyme and other spices created a gorgeous glaze using the moisture of the chicken I used it on. Just a little olive oil, the spice mix, four chicken breasts and a few minutes later, my chicken was ready to be baked up, with all the flavor packed in. 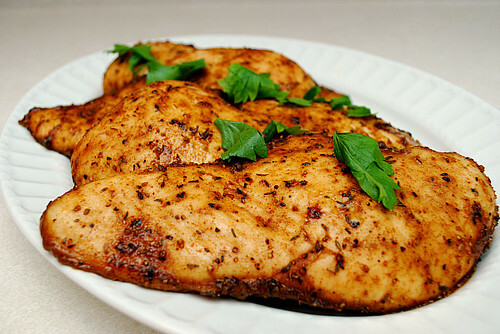 I baked the chicken breast uncovered in a 350 degree oven for 25 minutes. After the 25 minutes, I removed it from the oven and covered it with some foil to keep warm. The chicken came out beautiful and so tender! Definitely check out Urban Accent's line of dry glazes because this one was delicious and I have no doubt the others ones will be too!